These questions are at the core of the human experience and we revisit them throughout our lives. Even young children consider these seemingly abstract questions. One of the great privileges of parenting can be the opportunity to witness our children’s identity development from the very beginning. We remember our babies’ gurgles of pleasure and screeches of distaste as they fiercely communicated their likes and dislikes. We recall – often with nostalgia – our toddlers’ whispers in our ear about their wishes and their fears. These intimate early exchanges are our children’s first conversations with us about who they are. In elementary school these conversations continue quite openly. Children often define themselves by the activities they enjoy or areas in which they excel. They proclaim these traits decisively to their parents, and many children enjoy forthright dialogue with their trusted caregivers about their developing interests, skills, and relationships. And then along comes puberty. What happened to your chatty, energetic child? Who is this stoic and increasingly private young person? In fact, they are probably asking themselves the same questions. As children enter adolescence, the process of identity exploration often becomes more deliberate and, for many teens, figuring out who they are and who they want to be is the defining project of their teenage years. At the same time, many teens are less forthcoming with their parents, turning to peers and online resources for support and information. As parents, how do we stay in these identity conversations with our teenager? How do we help our teen to explore who they are in healthy, safe ways, while still offering them the space and privacy they crave? In this ongoing series, we will explore a variety of issues related to adolescent identity development, with a focus on how we can continue to nurture parent-teen communication and connection. To begin, here is a “top 10” list of general suggestions to encourage conversations with your teenagers about who they are. 2. Be a “potted plant parent.” Conversations about identity can be quite tender. Teens are often more willing to open up to their parents than we might think. Providing the right conditions for such a conversation to occur can help. Psychologist Lisa Damour describes the value of simply “being around” – like a potted plant – as both a source of support for your teen and as a way to encourage actual interaction. Consider your presence folding laundry while your teen is doing a reading about immigration for her history class. Just because you are there, she may be more likely to ask, “Hey, Dad? How do you define our ethnicity?” Dr. Damour also notes that parents who need to be out of the home due to work and other obligations have successfully used social media, texting and FaceTime to maintain their presence in their teens’ lives, virtually. 3. Pace yourself; pace your teenager. Many parents are anxious to know who their teen will become. But remember, even we are still discovering who we are. It may be helpful to recall the many times in our own lives that we thought we “had it all figured out,” only to have new roles and new experiences launch another cycle of exploration and discovery. Teens often feel great urgency around their identity questions, so it can be important to let them know that this is a lifelong journey. The metaphor of an upward spiral may be useful. We carry identity questions with us throughout our lives, revisiting them, resolving them, and then revisiting them once again as life circumstances evolve. 4. Offer a framework that encourages connection to others, not isolation. The capacity to consider existential questions like, “Who am I?” can be exciting and it represents an important cognitive milestone for your teen. Identity questions can also be overwhelming and can lead teens to believe that no one understands them or that they are alone on their quest for self-discovery. Indeed, teenagers are notoriously unskilled at recognizing that, in most cases, their concerns are not unique to them, but rather are part and parcel of the shared human experience. Many schools now offer explicit instruction about identity, with a focus on encouraging connective conversation among students about who they are. 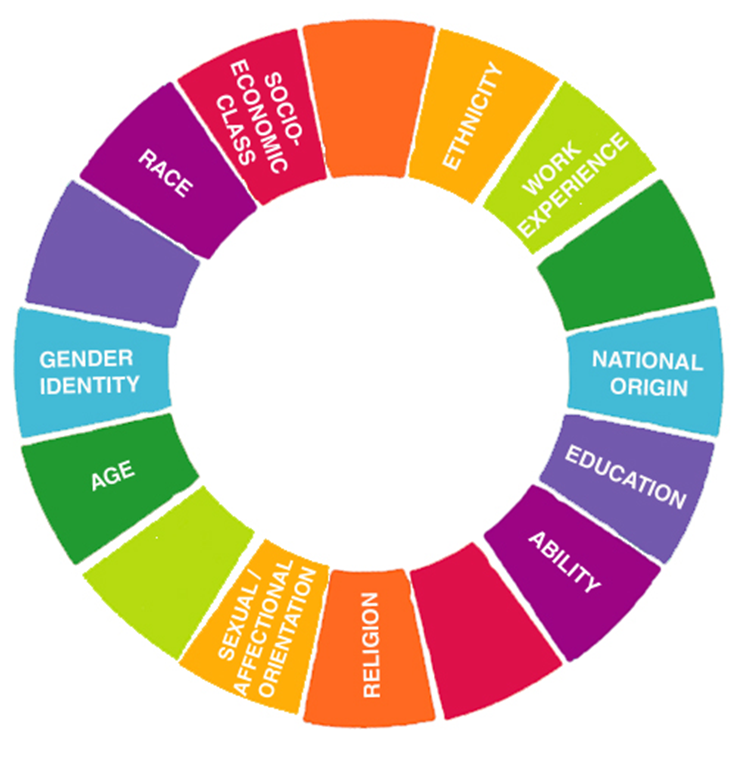 Social identity wheels, used frequently in school guidance programs, can be useful models to help you and your teen think concretely about some aspects of identity and how their identities relate to others around them. 5. Expect your own growth spurt! When parents engage with their teens’ identity exploration process, we inevitably learn a lot about ourselves as well. Sometimes this learning is sparked by teens’ questions about our own identity journeys. As parents revisit past experiences and piece together their own stories, the newfound coherence can be quite rewarding. How did you develop your views? How did you learn that your beliefs and values are right? How does your discomfort with your teen’s identity relate to your understanding of your own identity? What resources do you need to be able to support your teen right now? Counseling can be a useful resource for both teens and parents as they weather the growing pains of identity exploration. 7. A caveat: learning requires some individual homework. The balance of letting your teen teach you and doing your own learning is particularly important when teens are exploring identities for themselves – especially marginalized identities – that are different from yours. Part of maintaining the role of parent to your teen, even if you are “less informed” than they, means keeping healthy boundaries between you and your teen around your learning process. Your learning process is your own, and you deserve adult support as you go through it. Seeking support and guidance from your teenager around their identity process will not provide sufficient care for you, and it is not your teen’s responsibility to educate you. Doing your own research and counseling are great ways to strengthen your knowledge base, increase your skills in supporting your teen, and preserve your essential role as your teen’s caregiver, not vice versa. 8. The rule of “And, and, and”: There are so many facets to an individual’s identity. Each dimension has the potential for lifelong study without necessarily finding “the answer.” With so much to discover, understandably, teens (and adults, too!) often hyper-focus on one dimension of their identity at a time, defining themselves in just one way. While it is important to honor your teen’s areas of interest and focus, as their parent, you have an exceptionally wholistic view of who they are, and finding ways to remind them of their multidimensionality can be helpful. For example, if your teen is hyper-focused on their sexual identity, do listen raptly when they choose to share with you about the GLBTQIAA affinity group meeting they attended at school. Also express interest in the treehouse project that they seem to have abandoned – you know that being a builder is an important part of who your teen is, in addition to identifying as genderqueer. 9. Validate feelings, moderate behaviors. Figuring out who we are is highest-stakes emotional work. Acknowledging and affirming your teens’ emotional experience on this journey is one of the most powerful ways to care for them. It is an act of great respect for your teen to reject the stereotypes that devalue teenage emotionality. Let your teen know that their strong emotions are not only normal, but also valuable sources of information: feelings are data for us about our personal values, needs, and limits. Teaching your teen that all feelings are valid does not mean accepting that all behaviors that were sparked by strong emotion are okay. No matter how much anger, pain, or grief your teen feels, parents should maintain clear limits and expectations around how your teen may treat you and others, and around what behaviors you consider to be safe and unsafe. Behavioral limits continue to provide teens with clarity and reassurance that you are committed to protecting and caring for them, regardless of how strongly they appear to push back against your rules. 10. Finally, remember that taking care of yourself is good parenting. Hopefully you learned this nugget when you first became a parent, but whenever this wisdom presented itself to you, it was undoubtedly followed by its sister lesson: as a parent, taking care of yourself consistently is incredibly challenging. Each day, try to pause – if only for a few exhausted moments before drifting off to sleep – to notice what you need, and to consider whether and how you could meet those needs. Parents who prioritize self-care practices that are logistically simple, brief in time required, and reliably engender feelings of peace and productivity tend to find relative success in carving out moments for themselves regularly. What sorts of practices do you enjoy that meet these three criteria? I hope these suggestions offer you a place to start, or more likely, to continue, talking with your teen about their identity. Check back for more on identity conversations with teenagers.